I traveled to St. Helena in Napa Valley, CA in early January with my hubby, Tim, to experience Napa in the winter and celebrate Tim's 39th birthday. I'm so lucky that my wonderful Mom lives near us and offered to stay with William so Tim and I could have our first weekend away. He will be four in March, so it was definitely time, lol! We absolutely love Napa Valley and look forward to going for the food as much as the wine (maybe more). It's a foodie town through and through. It also doesn't hurt that Napa is bursting with natural beauty from the mountain views, vineyards all around, and charming wineries, shops, and restaurants everywhere you look. We had the pleasure of trying several experiences from St. Helena's Little Book of Big Experiences during our trip. The Little Book of Big Experiences contains 24 elevated wine and food tastings, cuisine from award-winning chefs, tours, and discounts at hotels, etc. The experiences are valid until the end of March 2018, so if you are traveling to Napa before then, or if this post inspires you to take a trip, I highly recommend checking it out. The book costs $100 per person and is valued at more than $1,000. You can read about all the experiences and details at StHelena.com. We stayed at the Las Alcobas hotel in St. Helena which opened last year. The property is stunning, exemplifies luxury, and has breathtaking vineyard and mountain views. It's an adult-only hotel with an outdoor heated pool, beautiful spa and steam room, yoga and fitness studio. With just 68 guest rooms it’s very quiet and romantic - perfect for a couples getaway. Our room was ultra luxurious, modern and spacious. They perfected every detail from the floor-to-ceiling windows, heated floors, luxurious bedding, and had a complimentary snack bar full of locally-sourced goodies. The bathroom was serious goals with an enormous glass shower and a huge bathtub - even the toilet seat was heated! The back patio featured cozy rocking chairs, AH-mazing vineyard views and our own fire pit. The patio was our favorite place to hang out and drink wine, as well as, a peaceful and serene spot to enjoy breakfast every morning. The first night we had dinner at Las Alcobas' on-site restaurant, Acacia House by Chris Cosentino. The restaurant atmosphere was very chic, welcoming and warm. We dined inside because it was a little cool in the evening, but the wraparound patio looked so inviting, brunch on the patio is definitely a plan next time we visit. We can’t wait to come back to this amazing place! We ordered a bottle of Seventy Five Cabernet and settled in for an amazing meal. 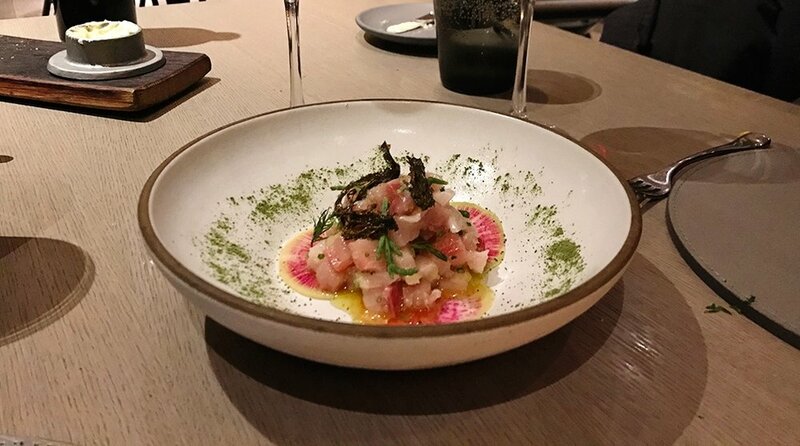 We started with the colorful, super fresh and delicious hamachi crudo appetizer. For entrees, I had the striped bass and brussel sprouts (my favorite side dish). Tim had the iberico pork schnitzel. Everything was plated beautifully and prepared to perfection. We truly enjoyed every bite. The chocolate dessert was a work of art - almost too beautiful to eat... almost! The sorbet was decorated with sugar-coated flower petals which were heavenly! This dessert is a must-try! Our first morning we had french press coffee and breakfast on the patio. The seasonal vegetable frittata and greens were so good we ordered it two days in a row. I scheduled a photo shoot following breakfast with a wonderful local photographer, John Klycinski. Then we headed over to the Culinary Institute of America (CIA) at Greystone for a behind the scenes tour of the CIA building. It's quite a beautiful and impressive historic building built in 1889. 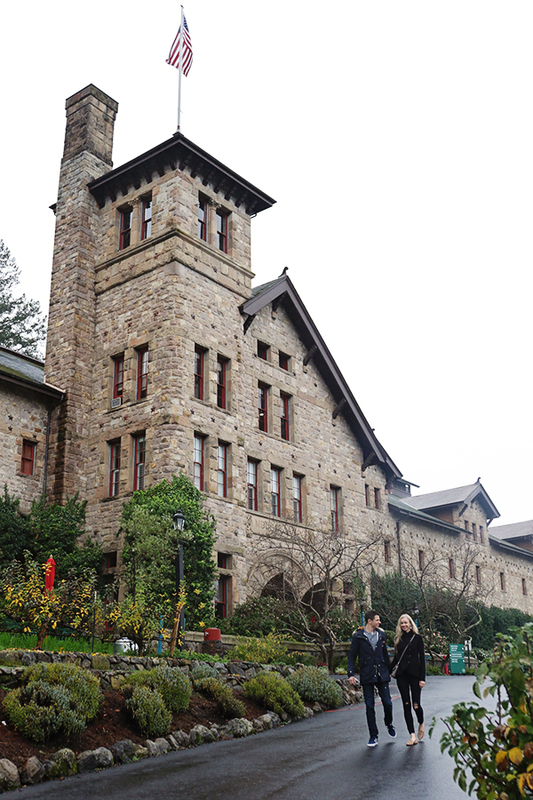 It was first used as a winery, then sold to Christian Brothers in 1945, prior to becoming the CIA in 1993. In addition to classrooms and teaching kitchens, the CIA has a student operated restaurant and cafe, a museum and a gift shop. The students cook in massive kitchens and with very impressive equipment. One of the CIA campuses has classes open to enthusiasts. I will schedule a cooking class during our next visit. We were lucky enough to be welcomed into the chocolate making classroom (not normally part of the tour). Renowned chef, Stephen Durfee, invited us to sample the chocolates he was making. They were NO JOKE the BEST chocolates I've ever eaten and I don't mess around when it comes to chocolate, lol. What a treat, literally! 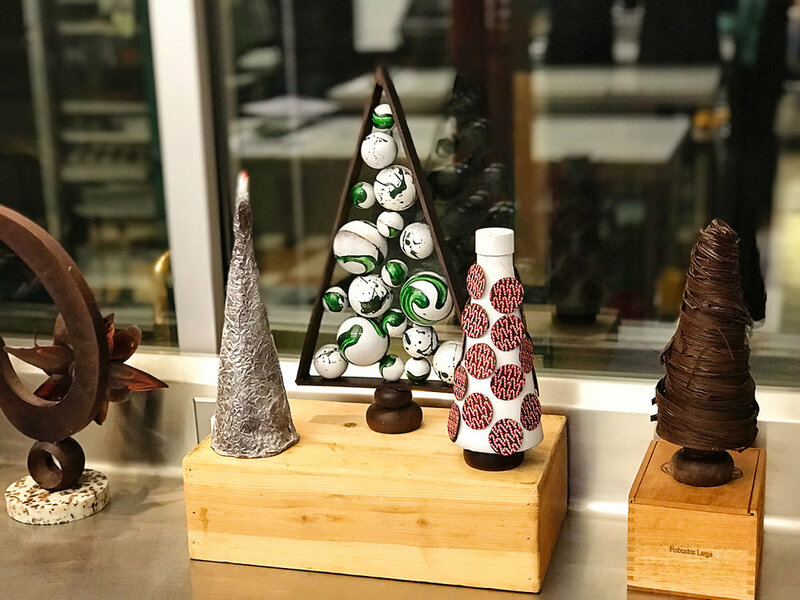 This photo shows some of the chocolate sculpture art pieces created by the CIA students. Lunch was at Clif Family Winery. Their tasting room, Velo Vino, has a very cool, relaxed vibe. You could instantly see that they have a unique and fun culture focused on wine, food, and cycling. Mountain bikes hang from the walls and a food truck is parked outside. In addition to wines, they also make artisanal seasonings, gourmet jams, seasoned nuts, and fine chocolates. Fun fact, it's also the same family that created Clif Bars. Our host designed a delightful wine and a food pairing, as well as, lunch from the Bruschetteria Food Truck. The smoked salmon bruschetta, brussel sprouts, corn, potatoes and chocolate chip cookie were all SO yummy. The menu changes daily, reflecting what is in season. We will definitely make a point to visit Clif Family every time we are in St. Helena. Our next stop was Provenance Vineyards - the property is stunning. We tasted a Provenance sauvignon blanc followed by the Reserve Wine Tasting which included four wonderful cabernet sauvignons. Our lovely host, Debbie taught me to smell wine from the lower rim of the glass to get more of the aroma versus smelling from the top of the glass where you will smell more of the alcohol. Try it, I was totally amazed. She took us on a brief tour of the barrel room and we tasted cabernet straight from the barrel. What a fun experience! I can definitely tell you the people in Napa are some of the friendliest and most welcoming I've ever met. They have a really tight-knit community and the businesses are very supportive of each other, sourcing their products locally whenever possible. 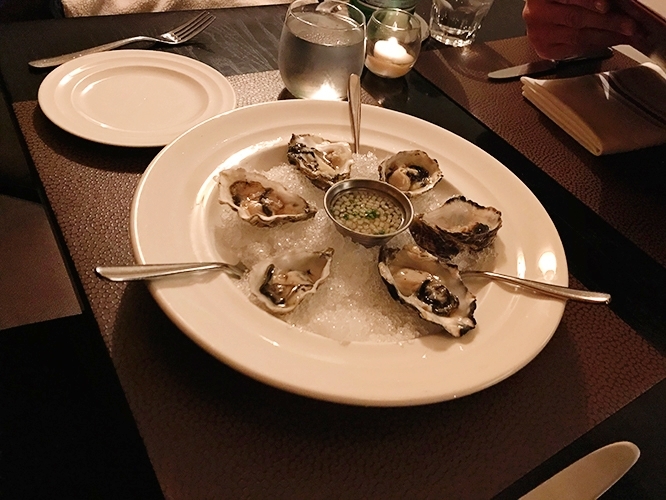 Dinner was enjoyed at the lovely Harvest Table by Charlie Palmer, refined, modern and sleek. Everyone was so welcoming and kind, and the food was equally beautiful as it was delicious. The bartender created a gin and tonic craft cocktail for Tim that was incredible and I ordered the Schramsberg sparkling wine. We had oysters, quail, filet mignon, and pan-roasted diver scallops. The coconut green curry mussels were so unique and delicious - another must-try. The chocolate and peanut butter bar dessert was decadent and the perfect finish. A bonus of the St. Helena Little Book of Big Experiences is that we didn't have to spend much time traveling from one place to another. On other Napa trips, we have spent a lot of time driving from one part of Napa to another. This was a nice change to stay in just one town and really get to know the area. A HUGE thank you to St. Helena and all of the wonderful establishments who hosted us! We had an unforgettable experience and look very forward to our next visit! Have you been to St. Helena or Napa Valley? If so, what was your favorite place or activity? If you have any questions about the Little Book of Big Experiences or anything we did on our trip, please let me know in the comments below!